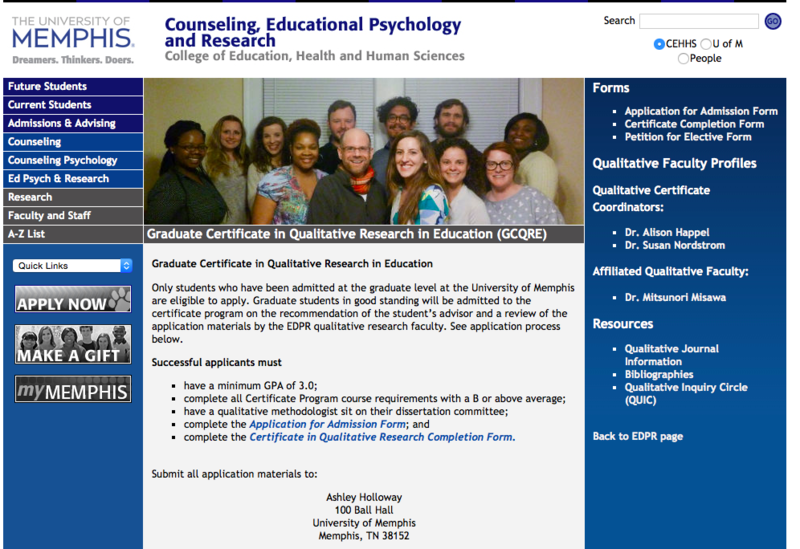 The University of Memphis offers a graduate certificate in qualitative research and courses in qualitative research design, methods, and theory. The institution encourages engaged scholarship in the Memphis area. To this end, faculty and students frequently engage in research projects with community members that advocate for social justice. Critical theories, feminisms, critical race theory, and poststructural theories are emphasized in such work. The University of Memphis will host the 2015 Southeast Philosophy of Education Society conference in February. The department of Counseling, Educational Psychology and Research also hosts monthly colloquia that feature faculty and student research from across the university. The Counseling, Educational Psychology and Research department also sponsors QUIC (Qualitative Inquiry Circle), a social and intellectual circle of graduate students with interest in qualitative inquiry, specifically inquiry that has the intent of advocating for social justice. QUIC is facilitated by Dr. Nordstrom and Dr. Happel-Parkins. Nordstrom, S.N. (In Press). Not so innocent anymore: Making recording devices matter in qualitative inquiry. Qualitative Inquiry. Nordstrom, S.N. (In Press). Notes toward a politics of response data: An affective passageway of layered response data. In A.B. Reinersten & A.M. Otterstad (Eds.). Metodefest og øyeblikksrealisme. Bergen, Norway: Fagbokforlaget. Nordstrom, S. (In Press). A data assemblage. International Review of Qualitative Research. Nordstrom, S. (2013). Object-interviews: Folding, unfolding, and refolding perceptions of objects. International Journal of Qualitative Methods 12, 237-257. Nordstrom, S. (2013). A conversation about spectral data. Cultural StudiesóCritical Methodologies. Special issue “Provocations: (Re)visioning data in qualitative research. 13(4), 316-341. Esposito, J & Happel, A. (In press). “You have to hold your own”: Investigating the Social Networks of a Diverse Group of Disenfranchised Urban Male Youth. The Urban Review. Happel, A. (2013). The Personal is Political: Feminist Resistance to Neoliberalism within the Academy. In E. A. Daniels & B. J. Porfilio (Eds. ), Dangerous Counterstories in the Corporate Academy: Narrating for understanding, solidarity, resistance, and community in the age of Neoliberalism. North Carolina: New Age Information Publishing. Happel, A. (2013). Ritualized Girling: School Uniforms and the Compulsory Performance of Gender. Journal of Gender Studies, 22(1), 92-96.